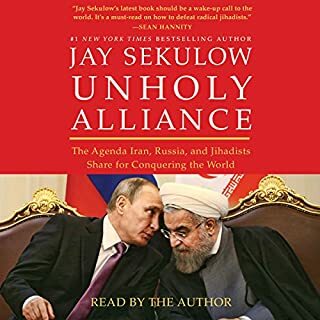 In Unholy Alliance, Jay Sekulow and the American Center for Law and Justice (ACLJ) tackle radical Islam head on. They expose the attempts by fundamentalist Muslims - both in the US and abroad - to destroy our legal system in favor of a system that would destroy our essential liberties. They bring attention to terrorism in today's world and reflect on the recent Paris and San Bernadino attacks as well as Russia, Syria, Iran, and continuous threats to our nation. Information dense, learned quite a bit, fast paced. Listened to it in a day at work.